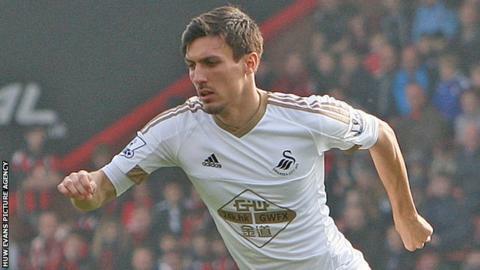 Midfielder Jack Cork hopes Swansea City can carry on their momentum against Chelsea at the Liberty Stadium on Saturday. Swansea have won three of their last five league games to pull 10 points clear of the relegation zone. Cork, 26, wants the Swans to build on recent results and end the season on a high. "We've had some great results and it would be a shame if we finished the season slowly," Cork said. "We need to carry on this momentum and try and get a few more points on the board. "I wouldn't say we're safe because mathematically we're not. "But we're in a good position at the minute and we've worked hard over the last few weeks." Saturday's opponents Chelsea have also had an indifferent season in which manager Jose Mourinho was sacked in December 2015. Guus Hiddink restored stability in his second interim spell as boss and the Blues are 10th with seven games to go. Cork expects a tough test against Hiddink's side but says wins over Manchester United and Arsenal this season proved the big clubs hold no fear for Swansea. "We normally do OK against the bigger teams and against Arsenal we had nothing to fear," Cork added. "They've [Chelsea] done a lot better in the second half of the season and they seem to be getting back to how they were before. "But we're in good form as well and it's a home game for us." "It's a big game for me personally," said Cork, who joined Swansea from Southampton in January 2015. "It's the team I grew up playing for and I had some great years there, made some great friends and learnt a lot football wise. "I'm looking forward to seeing a few old faces."